HAPPY CHRISTMAS and EXCITING NEW YEAR. Thank you for all your support in 2018. 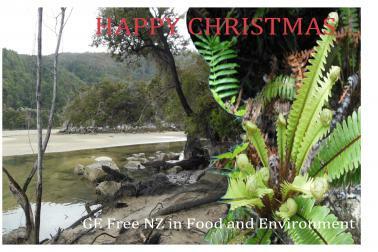 Aotearoa's growing environment is GE Free. See our latest 2018 Newsletter to catch up on the years mahi. The Resource Legislation Amendment Bill!! 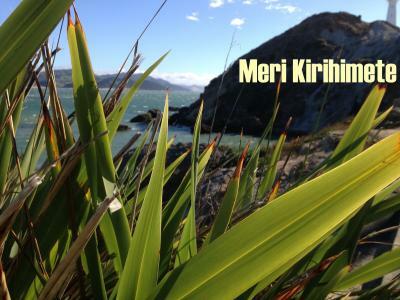 The passing of Percy Tipene is a great loss for Aotearoa (New Zealand) as well as for his family and friends. Mr. Tipene was visionary who taught by example and led the way in raising awareness of tikanga (indigenous lore), rongoa Maori (medicine) and the whenua (land). As a founding member of Te Waka Kai Ora his quiet dedication to mahinga kai (safe food production) led to the formation of Hua Parakore. He was highly concerned about the damage to the integrity of animals and plants from genetic engineering. He saw GMOs as an affront to tikanga Maori - disrupting the mauri, whanaungatanga and whakapapa now, and for future generations. He voiced his support for councils enacting precautionary principles on GMOs to protect the environment and communities including conventional and organic agriculture. He will be sorely missed by everyone who knew him. Our condolences are with his family, Ngāpuhi, Taitokerau. The push to remove local oversight is an attempt to destroy the idea of regional GE-free zones that most New Zealanders want to preserve. New Zealand producers and exporters should soundly reject any misguided efforts to force GE into the New Zealand agricultural sector...more. What you can do, more information at! !The Proposed National Environmental Standard for Plantation Forestry!! Do you want to make a submission? Here are some points to consider. Public submission period closes Monday 20th April. 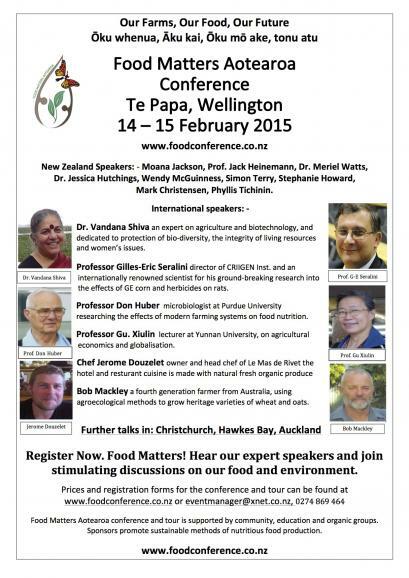 Food Matter Aotearoa Conference 14/15 February 2015 Te Papa Wellington. GE Free with Food Matter Aotearoa welcomes overseas speakers including Dr. Vandana Shiva, Prof. Gilles-Eric Seralini, and Prof. Don Huber. NZ is still GE Free in its farming environment! Have a happy Organic, pesticide free, locally grown GE Free Christmas. Dr. Vandana Shiva, Prof: Seralini and Prof: Huber will be discussing:- agroecology, organic, chemical and GMO agricultural systems. Be involved in building a thriving economy guaranteeing safe nutritional food production. Register now! Jeffrey Smith is only in New Zealand for two talks. 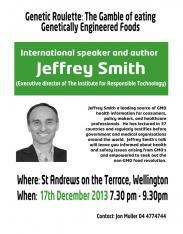 The first in Wellington on the 17 December at St Andrews on the Terrace - contact Jon Muller 04 4774744. On the 18th he will speak at The Free House, Collingwood in Nelson-contact Susie Lees 03 543 2341. Please ask Councillors to support the precautionary principle now!!! Freeze all new applications for GE foods while the FSANZ safety assessment regime is aligned with the European Food Safety Authority guidelines on GE; and past approvals are reassessed. 2. Enforcement and full labelling of all foods made using GE techniques including processed products such as: vegetable oils, starches, sugars, and meat, milk and eggs from animals fed GE feed. March Against Monsanto Oslo Norway. MARCH AGAINST MONSANTO, 25th May. - Wellington, Auckland, Tauranga, Hawkes Bay, Gisbourne, Rotorua Nelson, Christchurch, Whangarei and New Plymouth. For more info on your town time, place and contact go to the facebook site. Senior officers at Auckland Council have undue sway on information and processes that weakens local democracy and impacts the access councillors have to key documents. It is no good relying on industry studies: science must be unbiased and on the side of the public health. Those who are assessing GE food must be trained on the complex risks of GE/transgenic food and must stop dismissing all studies that go against the data supplied by industry," said Claire Bleakley. "We need the new Minster to intervene and stop standing on the sidelines while the integrity of New Zealand's food system is steadily undermined."...more. The FDA decision has caused alarm in the United States because the GE fish could be sold without any safety testing and would not be labelled, leaving consumers 'none the wiser'. Ideas for Holiday eating go to www.gefreepolicy.com a great place to find food companies committed to a GE Free food chain. Organically certified foods are guaranteed to be GE Free. Submission on A1073 GE Free NZ submission and examples. The lack of any animal feeding studies on a GE soybean designed to survive spraying with a cocktail of herbicides, will leave the public no better than lab rats unless the approval is immediately stopped. World Food Day Report here: FED UP with FSANZ* -allowing GM in our food - unlabelled, unethical, unwanted. The report, which details numerous tests raising health concerns while our food regulator FSANZ continues to let GM foods into Australia and New Zealand, will be launched to mark World Food Day in Melbourne, Perth and Wellington. It is unethical and unscientific for FSANZ to continue assuming GM is safe on the basis of patchy data provided by the GM companies themselves. Regulators appear to have a double standard of accepting GM company science without comment but fiercely attacking independent science that is published in peer-reviewed journals, whenever it contradicts their pre-conceived view of safety. The MADGE Report:Fed Up with FSANZ is being launched in Australia in Melbourne, Perth and in Wellington, New Zealand. 12pm meeting at the Ministry of Primary Industries 25 The Terrace moving to FSANZ offices 154 Featherston Street and to Parliament. Professor Jack Heinemann and Associate Professor Judy Carman, released an expert report evaluating the risks associated with the use of RNA molecules in genetically engineered wheat. 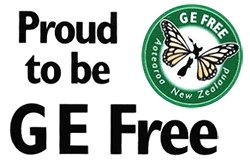 GE Free NZ AGM, 12.00-2.00 pm, 9th September 2012, Toi Poneke Arts Centre, Wellington, Everyone Welcome. The risks of increasing levels of pesticides in imported food produced with genetic engineering (GE) technology cannot be ignored, after one study found pesticide use had trebled since 2005. This is extraordinary, as the New Zealand public has no ability to challenge or have a voice in long-term decisions made on their behalf by Australia. The Tribunal decision implies New Zealanders have nowhere to go if they believe decisions made on their behalf are wrong,says Claire Bleakley ...more. The emergence of herbicide-resistant weeds as a result of planting genetically engineered crops is costing farmers dearly and shows the benefits of New Zealand's GE-free status. 'It's time for a re-direction of Science and Innovation funding away from the replanting of herbicide resistant GE Trees at Scion. Targeting valuable research funding on GE organisms, that harms our environment and internationally respected clean, green, natural brand position, must stop." ...more. Bokomo's Wheat Free Pronutro was found to contain both GE maize and GE soya: 90.36% GE maize and 71.42% GE soya. Impala / Springbok maize meal was found to contain 66.18% GE maize. This maize is labelled as Free of Additives and Gluten Free. Professor Seralini Tour dates of Australia and biography. The spin being pushed by the New Zealand Science Media Centre is obscure around important debates in science. "Sir Paul's leadership, compassion and humanity have been an enormous asset to New Zealand and he will be sorely missed, " says Jon Carapiet from GE Free NZ in food and environment. Further assessment of A1042 a GE Corn line herbicide resistant to 2,4-D.
Food Standards Australia New Zealand (FSANZ) are set to approve a 2, 4-D resistant corn. Public health will lose again as FSANZ is set to approve GE crops designed to survive spraying with a new range of toxic herbicides. FSANZ are risking the integrity of the food system by ignoring the toxicity of 2, 4-D and missing research data. 2, 4 -D is highly toxic to the thyroid and male reproductive system classing it as a potent endocrine disruptor. The approval of GE foods that promote the overuse of chemicals in our food chain must be stopped. Our food is being engineered to produce and be sprayed with increasing levels of highly toxic pesticides. Regulatory approvals are turning a blind eye to the health effects and allowing our food to become commercial toxic disposal factories". Congratulations WDC for listening to your Community. "The claims made by the report are only true within a framework of deceptive practices, which raise questions of ethics and academic credibility"
To field test Pinus radiate with genetic modifications to alter plant growth/biomass acquisition, reproductive development, herbicide tolerance, biomass utilisation, wood density and wood dimensional stability. A big "thank you" to all who have supported us. 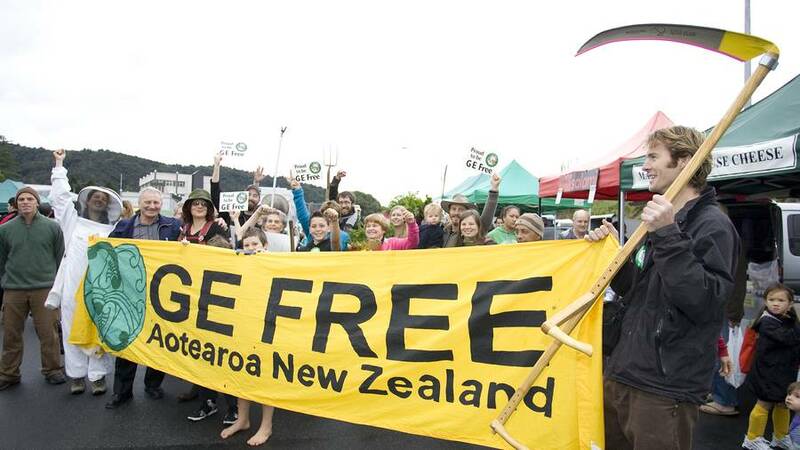 Please join us to help in the fight to keep New Zealand GE FREE. The Commerce Commission has warned Inghams about misleading the public about its products. It is worth reading the scientific advice provided to the Commission showing that GM-feed can result in differences in the animal eating the GM material. See: "Report on Animals Exposed to GM Ingredients in Feed" - J Heinemann. See our press releases: 19/07, 9/08 and 19/10. Monsanto pulls GM corn amid serious food safety concernsApplicant's dossiers contained wide-ranging fraudulent research. Heinemann also indicated that from comments released to him, it appears that Finland for example, was not satisfied with either the number or the of animal-feeding studies, and Malta voted to reject the maize on the basis of the INBI submission, "the same science that FSANZ attempted to bury down here." High Lysine GM Maize Withdrawn, Safety Concerns. It's NOT O.K.! Government research institute AgResearch has applied to develop genetically modified (GM) animals and commercialise their products. This move could pose the single biggest threat to farm animals and New Zealand cultural identity. If approved, AgResearch will be able to conduct broad-ranging genetic experiments on cows, goats, sheep, pigs, deer, llama, horses, rats, mice, guinea pigs, rabbits, and chickens. They will even use cells taken from humans and monkeys. 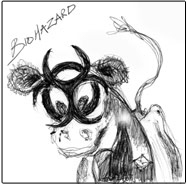 Their intention is to mix genes from different species to make transgenic animals. The process creates animal deformities, and new risks to human health, the environment and our reputation. AgResearch open ended genetic engineering experimentation has been overturned by a high court decision. The case taken by GE Free New Zealand was due to concerns that without a clear understanding of the organisms to be created any risk could not be evaluated. GE Free New Zealand argued that ERMA was wrong to accept the application in the first instance. Justice Clifford agreed that ERMA erred in its decision to accept the AgResearch application under the HSNO Act. This application can therefore no longer be processed. This application if approved could have allowed any DNA from animals (including human and monkey), plants, fungi, micro-organisms, viruses and/or synthetic sequences to be used in 9 livestock species. It would have set a precedent for carte blanche genetic engineering experiments in unidentified locations endangering New Zealand's agricultural economy and environment. More information please see GE Free New Zealand Press ReleaseSee the complete (46 pages pdf file) court document. Earlier this year the High Court upheld GE Free NZ complaint against other applications for GE animals by AgResearch. These applications for 'anywhere, anything, anytime' have the same flaws as the latest application (see: call for submissions). The decision is being appealed by AgResearch, with a hearing expected early 2010. See press release. 1545 Submissions recieved, 1527 against, 4 for, 11 ambivalent. AgResearch has applied to develop (in indoor and outdoor containment) goats, sheep and cows genetically modified to produce human therapeutic proteins, and to alter levels of gene activities and proteins for the study of gene function, milk composition and disease resistance. See press releases from and . Read the full application. Crop & Food Research in the South Island have applied to ERMA (the Environmental Risk Management Authority) for a 10-year field-trial of Genetically Engineered brassicas. The plants were engineered with Bacillus thuringiensis toxic CRY genes and bacteria and virus genes to kill cabbage white and diamond backed moth. Plantand Food Research has cancelled its genetic engineering trials on the breaches at the field trial of GE broccoli, cabbage, cauliflower and forage kale after recommendation on the breach from their internal report. This follows photographic and written evidence of the trial breaches presented at an urgent meeting to ERMA and MAF-BiosecurityNZ by GE Free NZ and Soil and Health. YOU SHOULD HAVE A SAY RE GENETIC ENGINEERINGFrom March all councils will be consulting you regarding plans for the next 10 years. It is imperative that they hear from you that GE release into our environment is an issue that must be taken seriously. Start your own Petition and give your GE Free requests more weight. Download a Petition Form and collect signatures of likeminded people in your community. Valuable resources to this are also available at: in the Take Action - Resources section. A test for Bt10 is currently available within the EU! Sign on to the GE Free Register and declare your property to stay GE free. Give a powerful message to those who intent to pollute the country with GE organisms. Research overseas shows that GE cannot be contained and threatens neighbouring properties. Check out how many have signed on in your area already!! The GE Free marches around the country were supported by thousands of people. Government however acted undemocratically deciding to lift the ge moratorium anyway, despite 70% of New Zealanders calling for it to stay in place. 1. Get as many people as you can in your area to sign the GE Free Register to support your calls for councilors to adopt a GE Free stance. 2. Contact your local councilors, encourage them to declare your local area GE Free. This year is local election year, find out prospective councilors opinions and support green candidates. 3. Visit your local Government MP–today, tell them your concerns and ask them to support their electorate! Write or talk to your local authority - questions referring to their new responsibilities in your area after the moratorium on GE is lifted. Check out suggested questions. New amendments are soon to be made to the Resource Management Act with more limited public notification on applications. 95% of resource consent applications are already processed on a non-notified basis and decisions are based solely on information provided by the applicant. >The Beginning of the End of the Human Race and the Start of a Trans-human Future? 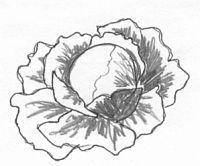 Analysis of the New Zealand Governments Proposals to Amend the Human Assisted Reproductive Technology Bill. Read article by Truman Barr - also includes lots of LINKS to "cloning related" sites or check out the "International Treaty Prohibiting Human Cloning and Inheritable Alterations"
About 10,000 people marched in Aucklandat a Rally on November 16, 2002 demanding Aotearoa New Zealand remain GE-Free in food and environment. What is Monsanto doing to farmers? In November, 2000 - in the middle of the Royal Commission on genetic engineering - the Government learned that a shipment of GE contaminated sweet corn seeds had been planted in three regions of New Zealand. Imposing strict secrecy, Prime Minister Helen Clark took control of the issue and said that the crops must be pulled out. Then the big business lobbying began. download leaflets, posters etc. for use on your stall. Prepared for the 'Life Sciences Network' / NZ Journalist Training Organisation workshop, Wellington 23 April 2002. Read the article online or alternatively download it here. The Royal Commission on Genetic Modification has delivered its recommendations to the Government. You can download the full report as a zipped up version from our website. Note: It's 5 MB in size.